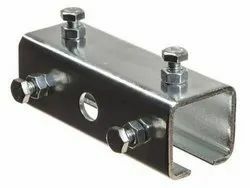 Our product range includes a wide range of aluminium bus bar system, aluminium joint clamp, bolt jointed aluminium bus bar, bolt jointed copper busbar system, bolted joint busbar and box type conductor. 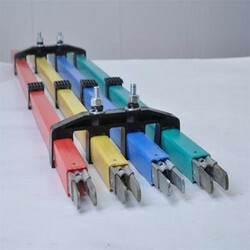 Aluminium Busbar System that can easily be used for various heavy duty applications. Demanded due to its easy installation, corrosion resistance, robust construction, wide applications, and several other features, we have been appreciated as one of the esteemed Manufacturers, Exporters Aluminium Busbar System Suppliers from gujarat, India. Bolted Joints are designed to rigidly join Conductor bars. Two bolts on either side ensure Electrically and Mechanically strong Point. Double bolted design provides smooth and perfect alignment at joints.This allows smooth glide of collectors. It is Bolt Jointed alluminium Bus Bar System that can easily be used for various heavy duty applications. Demanded due to its easy installation, corrosion resistance, robust construction, wide applications, and several other features, we have been appreciated as one of the esteemed Manufacturers, Exporters Bolt Jointed alluminium Bus Bar System Suppliers from gujarat, India. 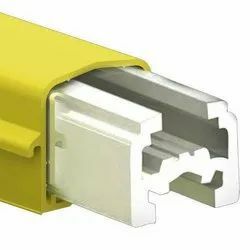 By utilizing skills of our experienced professionals, POWERLINE are providing our prestigious clients with a qualitative assortment of Shrouded DSL Bus Bar System. Owing to Features like high efficiency, low maintenance and corrosion resistance, these Bolt Jointed Copper Bus Bar System are extensively demanded by our clients. 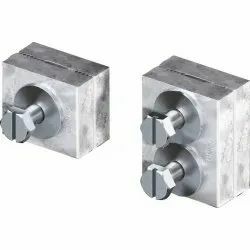 Besides being fabricated using high-grade material, these Bolt Jointed Copper Bus Bar System are tested thoroughly on a series of parameters to deliver best possible contentment from our end. GI: 60 A to 125A. Bolted joint Shrouded busbar system are used for the electrificatiion of mobile equipment. Shrouded busbar is a safe, economical and low maintenance way to solve mobile electrification requirement. Systems can be designed to accommodate 60 to 315 amp. Depending on the application there are various options and accesories that can be custom engineered for your conductor bar system. 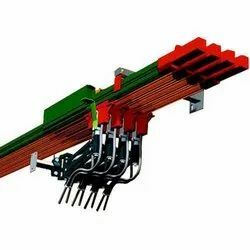 Box Type Conductor rail joint less conductor rails are modern & safe system for eeergy transmision for various type of equipment such as EOT crane, Mobile machinery, bridge crane,conveyar belts, chain conveyors etc. Owing to years of experience, we are engaged in offering a large variety of DSL System. In adherence with the industry standards and norms, these Box Type DSL Systems are developed into many of the different specifications. Our exclusive Box Type DSL System is offered at most economic rates that suitably meet budgetary limits of the clients. We offer these Box Type DSL Systems within the promised time frame. 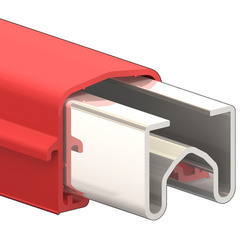 POWERLINE are manufacturing high-quality Bus bar system.POWERLINE Bus bar system is used in mobile electrification. 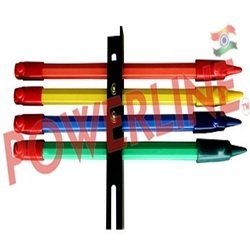 POWERLINE are manufacturer of Conventional DSL System which generally comprises of Indian standard Angle (ISA) or Rails,Brackets,Current Collectors Assemblies, Copper Expansion Compensetor, power feed clamp, control clamp. The conventional assembly is idealy suited when the current ratings are beyond 400amps under normal operation and shall be suited for lower ratings where the environment is dusty. 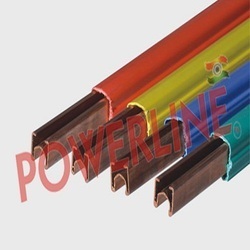 POWERLINE are the most trusted name engaged in offering a superior quality Copper Conductor Bar. 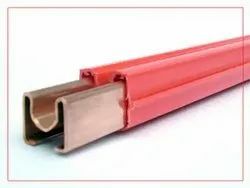 Our offered Copper Conductor Bar is precisely engineered by our competent and experienced professionals by utilizing basic components and advance technology in accordance with predefined quality norms. Our offered Copper Conductor Bar is made accessible in different stipulation for our customers with different choices. 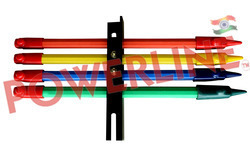 POWERLINE INDUSTRIES is the leading manufacturer exporter of Crane Busbar system.Crane Bus bar system are used for the electrification of mobile equipment. We have a comprehensive range of Bright light lite sparkle which is load monitoring system. The bus bar system is manufactured under the strict supervision by highly experience and technically knowledgeable persons and is thoroughly checked before it is dispatched from the factory. Separate conductors shall be provided for each phase. Cover with ultra violet additive for outdoor sun locations. High temperature cover (280F) for all conductors. Stainless steel conductors in for corrosive atmospheres. Epoxy coated, stainless steel, and insulated hangers for wet an corrosive atmospheres. Factory built expansion sections and anchors for expansion control. Factory bent curved conductor sections systems. A variety of covers for matching competitive systems. Heated conductor systems for ice prevention on outdoor systems or freezer storage. Totally enclosed covers with flap for air-born contaminants, indoor outdoor versions. Bare conductors available for extreme heat applicationsSpecial long-wear collector brushes for systems. Cover with ultra violet additive for outdoor sun locations. High temperature cover (280F) for all conductors. Stainless steel conductors in for corrosive atmospheres. Epoxy coated, stainless steel, and insulated hangers for wet an corrosive atmospheres. Factory built expansion sections and anchors for expansion control. Factory bent curved conductor sections systems. A variety of covers for matching competitive systems. Heated conductor systems for ice prevention on outdoor systems or freezer storage. Totally enclosed covers with flap for air-born contaminants, indoor outdoor versions. Bare conductors available for extreme heat applications Special long-wear collector brushes for systems. Shrouded Busbar Dsl system are used for the electrification of mobile equipment. Shrouded bus bar is a safe, economical and low maintenance way to solve mobile electrification requirement. Systems can be designed to accommodate 60 to 1200 amperes. Depending on the application there are various options and accessories that can be custom engineered for your conductor bar system. Portions of the system can be pre-assembled at the factory to help ease installation. 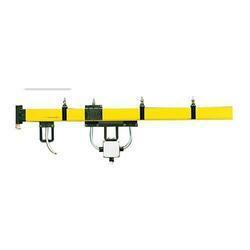 Conductor bar can be found on overhead crane runways, hoists, trolleys, conveyors, port crane and people movers. - Special long-wear collector brushes for systems. By utilizing skills of our experienced professionals, we are providing our prestigious clients with a qualitative assortment of Crane Safe Track.Owing to Features like high efficiency, low maintenance and corrosion resistance, these Crane Safe Track are extensively demanded by our clients. Besides being fabricated using high-grade material, these Crane Safe Track tested thoroughly on a series of parameters to deliver best possible contentment from our end. Current collector are available different ampere capacity 60AMP,80AMP,100AMP,125AMP,250AMP. POWERLINE are also manufacturing Current Collector For Enclosed Jointless for angle type MS DSL bus bar in different Current capacity 250AMP,500AMP,800AMP,1000AMP. POWERLINE are manufacturer and export curved busar. Curved enclosed conductor rail are used for electrification of crane, hoist and moving machinery. This system are available 40amp to 200amp copper. Powerline system are used in Foundary,Automobile industries, Paper industries, port and shipyard, rolling mills,and heavy engineering industries. Being a quality centric company, POWERLINE are engaged in offering a superior quality Towing Arm. our offered product is manufactured by our team of qualified professionals processing wide knowledge in their concern field. We strictly check this product to ensure its excellent quality and finish. 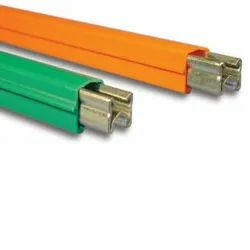 It is Bolted type DSL System that can easily be used for various heavy duty applications. Demanded due to its easy installation, corrosion resistance, robust construction, wide applications, and several other features, we have been appreciated as one of the esteemed Manufacturers, Exporters and Bolted Type DSL System Suppliers from Gujarat, India. POWERLINE have integrated our buisness activities to manufacturing Current Collector for EOT Crane moreover, we have a large inventory of stocks that enable us not only to take up our assignments on time but also to deliver these products within the stipulated time frame. This is a part of EOT crane and crane components. It is EOT Crane DSL Line that can easily be used for various heavy duty applications. Demanded due to its easy installation, corrosion resistance, robust construction, wide applications, and several other features, we have been appreciated as one of the esteemed Manufacturers, Exporters EOT Crane DSL Line Suppliers from gujarat, India. 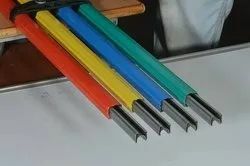 The enclosed Conductor rail joint less conductor rails are modern & safe system for eeergy transmision for various type of equipment such as EOT crane, Mobile machinery, bridge crane,conveyar belts, chain conveyors etc. This is newly developed DSL System by POWERLINE. This is a single pole system. Copper strips of high conductivity are used as conductors for high performance. We recommend this for medium size factories installing smaller capacity cranes requiring not more than 140amps. This system is very easy to install and being joint less has less failure rate. Wear and tare is also less which improves life of current collectors' at least by 50%. Smooth running of the DSL ensures best performance of control panels with VVF drives. This Jointless DSL Bus Bar System is newly developed DSL System by POWERLINE. This Jointless DSL Bus Bar System is a single pole system. Copper strips of high conductivity are used as conductors for high performance. We recommend this for medium size factories installing smaller capacity cranes requiring not more than 140amps. 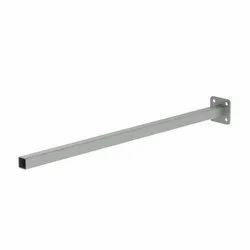 This Jointless DSL Bus Bar System is very easy to install and being joint less has less failure rate. Wear and tare is also less which improves life of current collectors' at least by 50%. Smooth running of the DSL ensures best performance of control panels with VVF drives. POWERLINE offer Pin Type DSL Shrouded Conductor, Pin type DSL Bus Bar System are used for power transmission. 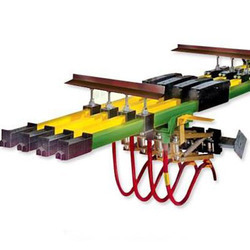 Conductor rails provides a safe and economical supply of electric power for track guided Mobile machinery. Single Pole individually Insulated conductors. 1 Pole / 4 Pole Hangers. It is PVC Enclosed Busbar that can easily be used for various heavy duty applications. Demanded due to its easy installation, corrosion resistance, robust construction, wide applications, and several other features, POWERLINE have been appreciated as one of the esteemed Manufacturers, Exporters and Bolted Type DSL System Suppliers from Gujarat, India. Cover with ultra violet additive for outdoor sun locations, High temperature cover (280F) for all conductors, Stainless steel conductors in for corrosive atmospheres. Epoxy coated, stainless steel and insulated hangers for wet an corrosive atmospheres. Factory built expansion sections and anchors for expansion control, Factory bent curved conductor sections systems. A variety of covers for matching competitive systems. Heated conductor systems for ice prevention on outdoor systems or freezer storage. Totally enclosed covers with flap for air-born contaminants. indoor outdoor versions. Bare conductors available for extreme heat applications. Special long-wear collector brushes for systems. 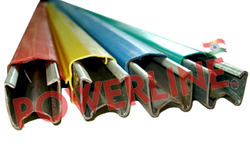 By utilizing skills of our experienced professionals, POWERLINEare providing our prestigious clients with a qualitative assortment of Shrouded DSL Bus Bar System. Owing to Features like high efficiency, low maintenance and corrosion resistance, these Shrouded DSL Bus Bar System are extensively demanded by our clients. 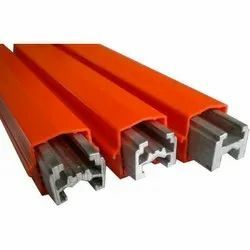 Besides being fabricated using high-grade material, these Shrouded DSL Bus Bar System are tested thoroughly on a series of parameters to deliver best possible contentment from our end. By utilizing skills of our experienced professionals, we are providing our prestigious clients with a qualitative assortment of Shrouded Bus Bar System. Owing to Features like high efficiency, low maintenance and corrosion resistance, these Shrouded Bus Bar Systems are extensively demanded by our clients. Besides being fabricated using high-grade material, these Shrouded Bus Bar Systems are tested thoroughly on a series of parameters to deliver best possible contentment from our end. 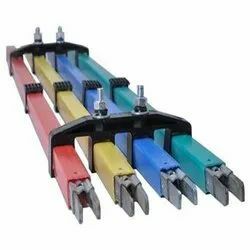 By utilizing skills of our experienced professionals, POWERLINEare providing our prestigious clients with a qualitative assortment of Shrouded Busbar (DSL) System. Owing to Features like high efficiency, low maintenance and corrosion resistance, these Shrouded Busbar (DSL) System are extensively demanded by our clients. 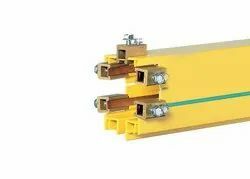 Besides being fabricated using high-grade material, these Shrouded Busbar (DSL) System are tested thoroughly on a series of parameters to deliver best possible contentment from our end. 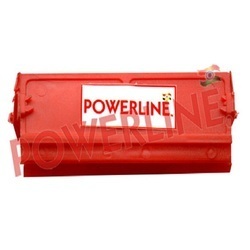 To provide the best in quality product to our clients, POWERLINE are betrothed in Manufacturing. Exporting and supplying a wide range of Track Coupler. 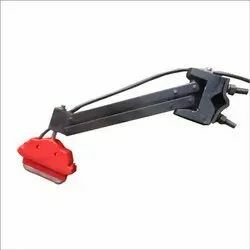 Offered clamp is manufactured as per preset industry norms using supreme quality raw materials and pioneering tehniques at your advanced production set up. This clamp is utilized for assembling and fastening the mobile equipments. V type single pole conductor system is a DSL system which can accommodate large cross section of conductors these can accommodate 92sq mm to 200sqmm of copper conductor for wide range of heavy duty applications. 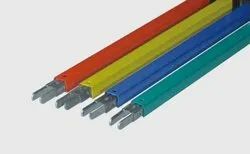 These V Type DSL Bus Bar Systems are specially recommended for rough handling and high current applications special high temperature insulation can be given. This can withstand up to 80degree centigrade. 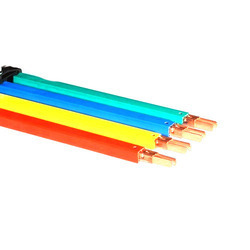 V type Insulated conductor rails range from 60 to 1000 A. These V Type DSL Bus Bar Systems are suitable for supplying power for a wide range of applications, e.g., multiple cranes in one bay, heavy capacity cranes, and transport installations with several lifting and conveying devices, amusement rides, Coal/coke pusher cars and many more. POWERLINE INDUSTRIES is a well known manufacturing, supplying, exporting and trading firm of V Type Shrouded DSL systems. V type single pole conductor system is a DSL system which can accommodate large cross section of conductors these can accommodate 92sq mm to 200sqmm of copper conductor for wide range of heavy duty applications. Insulated conductor bars are touch proof. No exposed live parts shrouded ip21. 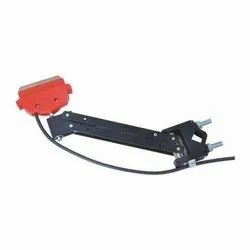 Pin joint Shrouded Bus bar system are used for the electrification of mobile equipment.